I'm back, just in time for the third and final Tuesday of July! I missed the first two July Tuesdays with Dorie recipes of the month (semolina bread and hazelnut biscotti) because we were on our annual three week trip out West to visit my in-laws. 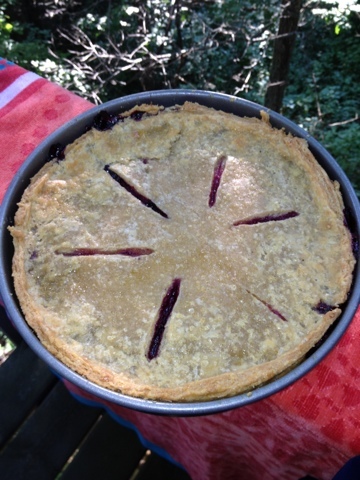 Luckily July has three Tuesdays, and we got back just in time for blueberry and nectarine pie. The crust and I didn't get along fabulously, but that was mostly my fault: the dough calls for butter and shortening, but I don't keep shortening in the house. I used all butter, with a little extra water...but the dough was still too dry and crumbly. It actually got easier after it warmed up a bit, and I was able to roll it out. 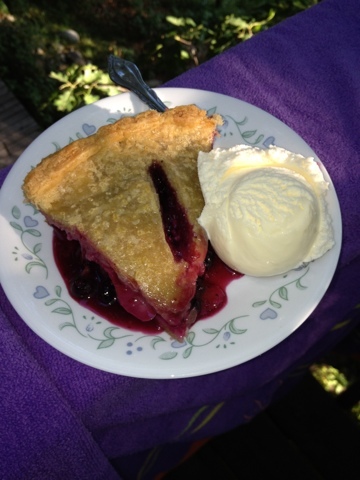 The filling was easy to make, with fresh blueberries and nectarines, half of which were cooked down first. After adding the top crust, I froze the pie according to the recipe directions. I only froze it for a day, but I wanted to be able to enjoy it fresh at the cabin. At the cabin, I painted an egg wash, sprinkled coarse sugar on the top, and cut slits. Then I baked it for about 60 minutes.